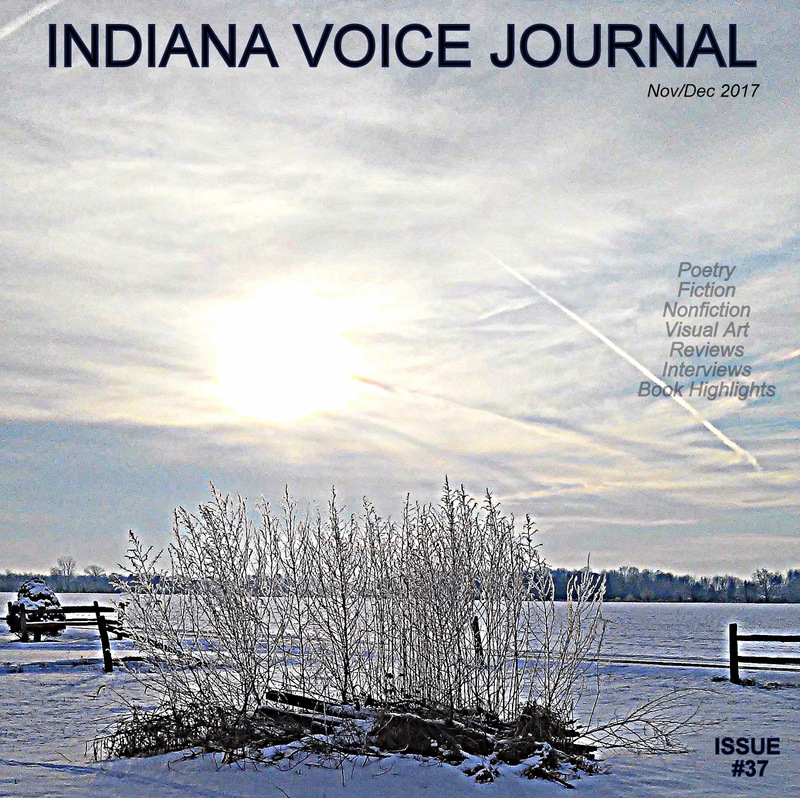 Merry Christmas to all our friends at Indiana Voice Journal. This is an all-star issue from an amazing group of poets, artists, and writers. I know it came out more than a little late, but I promise, you will enjoy reading the vast variety of content in this issue. I thank each and every one of you for your contributions and support in various ways. Poetry Society of Indiana 39th Annual Fall Rendezvous Poetry Contest 2017 Winners List! Two Poems by Cecilia Soprano: "This October 28, 2017" and "Wind swept"
Three Poems by Alex DeBonis: "Lover," "Bribes Like These," and "Wishes of the Deceased"
Two Poems by Anwer Ghani: "My Grandfather's Flowers" and "My Grandmother's Whispers"
Three Poems by Duane Vorhees: "Another Noel," "Damascus," "Headlines and What Happened to Our Myths," and "On Returning Home After Half a Century"
Three Poems by Harry Youtt: Late Afternoon Autumn," "Even the Autumn Leaves," and "One of Those Days"
Four poems by Janice Canerdy: "Old? Are You Talkin' to Me?," If," Two Roses: a Tanka," and "Fall Haiku"
Three Poems by Jon Bennett: "Golden Boy," "Elephant," and "Shepherd"
Two Poems by Lance Carpenter: "Night Cardinal" and "Wake"
Three Poems by Mark Danowsky: "First Day of Fall," "Wrongheaded," and "This Is the Part of the Walk I Like Best"
Two Poems by Sanjeev Sethi: "Remembrance" and "Shadows"
Two Poems by Saloni Kaul: "Screechscape" and "Fathom Taste"
Creative Nonfiction by Charles E.J. Moulton: "The Violinist"
Fiction by Cecilia Soprano: "Santa's Brother / A Christmas Satire"
Fiction by Muhammad Nasrullah Khan: "The Soul Healer"
Cecilia is a published poet from Kanonah, N.Y. She writes stories; and has also published 3 small books. The science and observation of the wild, and natural environment are her subjects and inspiration. She also has endless fascination with the human psyche in all its complexities of expression. Alex DeBonis grew up in Seymour, Indiana and graduated from Indiana University. His work has been published or is forthcoming in Buck Off Magazine, Tipton Poetry Review, Hartskill Review, Indiana Voice Journal, Yellow Chair Review, Parade, and Ilanot Review. Anwer Ghani is an Iraqi poet and writer. He was born in 1973 in Hilla. His work has appeared in Otoliths, Adelaide, November Bees, Zarf, Peacock, Eunioa, Rabbit and many others. He is the author of several books, including "Narratopoet" (Inventives Cloud 2017), "Antipoetic Poems" (Create Space 2017), "TRUMP; a poetry collection" (Inner Child Press 2017) and "The Narratolyric Writing" (Smashwords 20170). Visit his blog at: https://anwerghaniwriting.blogspot.com/p/blog-page.html. Duane Vorhees was born in Germantown, Ohio, near the Indiana border. He moved to nearby Farmersville when he was 10 and spent his adolescence there -- or, rather, his adolescence spent him! After high school he briefly attended "The" Ohio State University before graduating from Bowling Green State University in Bowling Green, Ohio with a degree in American Studies. And then, predictably enough, he left Ohio for good (or bad, of course, depending on one's preference). He has spent most of his life abroad, mainly teaching in Korea and Japan for the marvelously redundantly named University of Maryland University College. Now he is happily retired in Khon Kaen, Thailand, where he publishes a daily creative arts magazine, duanespoetree.blogspot.com. Harry Youtt is a frequently published poet, essayist, and writer of short stories. He is a long-time faculty member in the UCLA Extension Writers Program, where he teaches courses and conducts workshops in fiction writing, memoir writing, and poetry. He is author of several poetry collections, including Getting Through, Elderverses, and Outbound for Elsewhere. Janice Canerdy is a retired high-school English teacher from Potts Camp, Mississippi. She's been writing poems for decades. She writes: "I especially enjoy rhymed-metered poetry and get a kick out of writing parodies of the classic poems I taught." Her poems and stories have appeared in several magazines and journals, including "Light Quarterly," "The Road Not Taken," and "Better Than Starbucks." Her work has also appeared in anthologies. Her first book, "Expressions of Faith" (Christian Faith Publishing), was published in December 2016. Lance Carpenter is a poet and undergraduate in Purdue University's Creative Writing program. His work has appeared in Tributaries from IU East and The Eunoia Review. Mark Danowsky’s poetry has appeared in About Place, Cordite, Gargoyle, Grey Sparrow, Right Hand Pointing, Shot Glass Journal, Subprimal, and elsewhere. He is originally from Philadelphia, but now lives in West Virginia. He is Managing Editor for the Schuylkill Valley Journal and Founder of the poetry coaching and editing service VRS CRFT. Sanjeev Sethi is the author of three books of poetry. His most recent collection is This Summer and That Summer (Bloomsbury, 2015). His poems have appeared venues around the world, including Spirit Fire Review, Empty Mirror, The Paragon Journal, Grey Sparrow Journal, Soul-Lit, New Mystics, Stride Magazine, London Grip, Communicators League, and elsewhere. He lives in Mumbai, India. Saloni Kaul, author and poet, was first published at the age of ten and has been in print ever since. As critic and columnist Saloni has enjoyed thirty eight years of being published. Her first volume, a fifty poem collection was published in the USA in 2009. Subsequent volumes include "Universal One" and "Essentials All." Her poems have appeared in the Tipton Poetry Journal, Eye On Life Magazine, Inwood Indiana, Misty Mountain Review, Poetry And Paint Anthology, Mad Swirl's Poetry Forum, and others. She lives in Toronto, Canada. Toti O'Brien is the Italian Accordionist with the Irish Last Name. She was born in Rome then moved to Los Angeles, where she makes a living as a self-employed artist, performing musician and professional dancer. Her work has most recently appeared in Fiction South East, NonBinary Review, OVS Magazine, and The Adirondack Review. 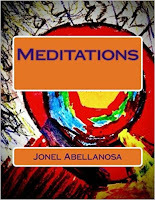 Meditations by Jonel Abellanosa is a beautiful book of 27 poems that seem to be written straight from the author's heart. I found the poems touching, meditative, and very much "alive" in a divinely inspired way. Many are written in the first person, which gives you a sense of the inner strength and character the poet draws upon to craft these poems. Strong in visual imagery. Lyrical, whimsical, magical...They beckon to you from the page, then leave you reeling in a profound and quiet way. 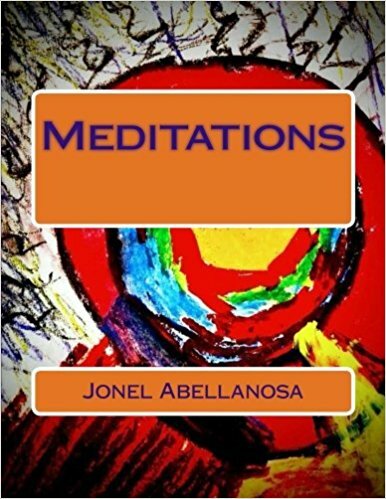 Few poets can invoke that sense of wonder and awe we long for after the book has been closed, but Jonel Abellanosa is one who can and does, whether intentional or not. Conor O'Sullivan received a BA in History and Political Science from UCD and an MA in International Affairs from NYU. 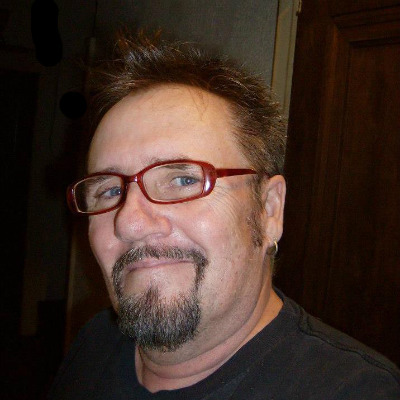 His short fiction has been published in the Lakeview Journal, the Bitchin' Kitsch and accepted to Dual Coast Magazine, an affiliate publication of Prolific Press. The Short Story, a UK independent publisher, will publish his work, 'Out to Wreck', as a chapbook in 2018. He lives in London where he works as a sports journalist. Sheehan served in the 31st Infantry in Korea 1951-52, graduated Boston College 1956, published 30 books, multiple works in Rosebud, Literally Stories,Linnet’s Wings, Serving House Journal, Copperfield Review, Literary Orphans, Eastlit, Indiana Voices Journal, Frontier Tales, DM du Jour, In Other Words-Merida,Literary Yard, Rope & Wire Western Magazine, Greensilk Journal. He has received 32 Pushcart nominations and 5 Best of Net nominations, sundry other awards. Newer books are Swan River Daisy, Jehrico, and The Cowboys, with 3 books being considered, and one to be published on November 1, by Pocol Press, Beside the Broken Trail. Alice Frances Wickham is from Ireland. She has lived in London since 1987 and has been writing on and off during that period. 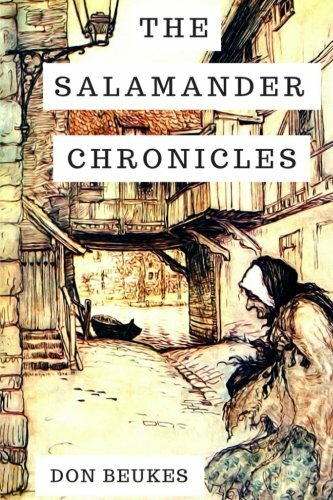 In 2011 Alice completed her Masters in Writing and Literary Criticism at Birkbeck in London and she has embarked on a novel, which has morphed into a perpetual saga, and Alice hopes it will end before she does. Alice is also working on a satire about the Health Industry, which is nearing completion. She runs the popular blog, newlondonwriters.com, and her work has appeared in Edge magazine, Litro magazine, New London Writers, Paradise Press, and other outlets. Andrew Hogan received his doctorate in development studies from the University of Wisconsin-Madison. Before retirement, he was a faculty member at the State University of New York at Stony Brook, the University of Michigan and Michigan State University, where he taught medical ethics, health policy and the social organization of medicine in the College of Human Medicine. I live with my children and crazy dogs in Middletown, Kentucky, a stone's throw from the beautiful horse farms Kentucky is always bragging about. During my career in education, I served as middle school principal in one of the largest school districts in the US; I share many skills with cat-herders. I love to read, write, cook, and sit in the sand watching the waves when I can. 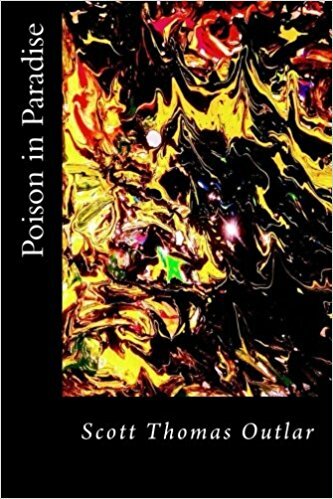 My poems and stories have appeared in several journals and anthologies. I'm also published in children's literature. This month's featured books will make wonderful Christmas presents! "Across the Light" by Bruce Owens, "The Wild Essential" by Claudine Nash, "Languid Lusciousness with Lemon" by Joan Leotta, and "Have We Been Screwed?" by Teresa Roberts. With this issue, we're sending thoughts, prayers, good vibes, and positive energy to our poetry editor, David Allen as he recovers from surgery, and to Jennifer Criss, our art editor, as she has made the decision to leave Indiana Voice Journal. We are going to miss her, and we appreciate all the hard work she has poured into IVJ. For now, all visual art and photography should be sent to indianavoice@gmail.com. I've updated our guidelines page to reflect that change and a change concerning reprints and multiple category submissions as well. Be sure to check before submitting. If you haven't heard of Twitter-famous parenting comedian James Breakwell, be sure to check out our interview, and an excerpt of his first book "Only Dead on the Inside: A Parent's Guide to Surviving the Zombie Apocalypse." His story is inspiring, and his humor, hilarious! Book Excerpt: James Breakwell aka @XplodingUnicorn "Only Dead on the Inside: A Parent's Guide to Surviving the Zombie Apocalypse"
Three poems by Edilson Afonso Ferreira: "Cherished Desires," "Your Earthly Days," and "Languages"
Three Poems by JD DeHart: "Major Major," "Opus," and "Doesn't Leave the Room"
Three Poems by Lynn White: "Autumn Rain," "Nuts," and "Flash"
A Poem by Sreyash Sarkar: "I'm 23 and Wearing a White Kurta"
Three Poems by Ken Allan Dronsfield: "Au Revoir to Summer," "Sleep with Dead Grass," and "A Lyrical Swell"
Three Poems by Teresa Roberts:"Nature Erotica," "Little Yeses" and "Gypsy Soul"
Three Poems by Ken Williams under the title REASONS WHY: "Survivors," "What Not," and '"This One Thing Right"
Three Poems by Ann Christine Tabaka: "Ode to the Moon," "The Shadow Game," and :The Sea Below"
Three Poems by Jordan Krais: "March," "Siren of the North Shore," and "Uncle David"
A Poem in Six Parts by Charles E.J. Moulton: "All Because of Music"
Six Poems by Todd Outcalt: "The Human Cannonball," "The Ringmaster," "The Bearded Lady," "The Strong Man" "The Geek," and "The Trapeze Artists"
Three Poems by Lisa Keifer: "Autumnal Insight," "Glass Vase," and "The Sister." Three poems by Marianne Lyon: "Grandma's Harmonica," "I Lost My Gift for Being Alone,' and "Never Never Loved"
Flash Fiction by Robert L. Penick: "Grandmother, Coney Island Bus Line, July 27th, 1992"
Fiction by Jeff Burt: "The Fragrance of Fumes from an Internal Combustion Engine"
CNF/Memoir by Lucia Walton Robinson: "Kind-Hearted Woman"
Interview with Comedy Writer James Breakwell aka: @XplodingUnicorn "Only Dead on the Inside: A Parent's Guide to Surviving the Zombie Apocalypse"
James Breakwell, an Indianapolis-based comedy writer behind the viral Twitter account @XplodingUnicorn built up nearly a million followers by writing family-friendly jokes about his four daughters, ages 7 and under. James parlayed this meager (his words) internet accomplishment into a book deal. His comedy book, "Only Dead on the Inside: A Parent's Guide to Surviving the Zombie Apocalypse" comes out October 10th. 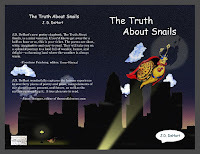 It's being published by BenBella Books, and is available for pre-order. 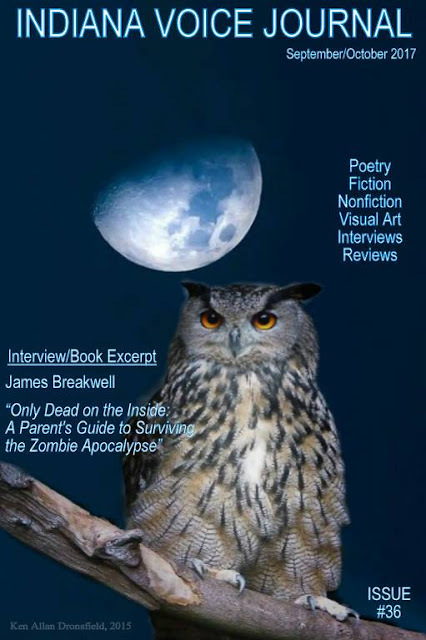 Book Excerpt: James Breakwell aka:@XplodingUnicorn "Only Dead on the Inside: A Parent's Guide to Surviving the Zombie Apocalypse"
James Breakwell is a professional comedy writer and amateur father of four girls, ages seven and under. He is best known for his family humor Twitter account @XplodingUnicorn, which has more than 700,000 follow- ers. The account went viral in April 2016 thanks to a feature article on the front page of Buzzfeed. The resulting attention from media outlets around the world transformed Mr. Breakwell from a niche comedy writer into one of the most famous dads on social media. Henry Ahrens lives, writes, and teaches a variety of high school English classes in the leafy hills of Cincinnati, Ohio. His work has appeared in Tipton Poetry Journal, From the Edge of the Prairie, and Pudding Magazine. Sarah Henry is a former student of two U.S. Poet Laureates at the University of Virginia. Today she lives near Pittsburgh, where her poems have appeared in the Pittsburgh Post-Gazette, the Pittsburgh Poetry Review and The Loyalhanna Review. Farther afield, Sarah's work was published by Soundings East, and The Hollins Critic. Her poems have been included in six recent anthologies. CheapPop and Donut Factory featured her humorous prose. Edilson Afonso Ferreira,73, is a Brazilian poet who prefers to write in English rather than Portuguese. He began his literary life when he was 67 and has been published in numerous literary journals. Ferreira lives in the small town of Formiga with his wife, three sons and a granddaughter. His first Poetry Book, “Lonely Sailor,”is scheduled for publication in 2018 by Olympia Publishers, London, UK. He was been nominated for The Pushcart Prize 2016. Rafik Massoudi was born in Tunisia iand now lives in Oman. He received an M.A. in English Language and Literature in 2008 from the Higher Institute of Languages in Tunis. Currently, he is Lecturer of English Language, English Language Unit, Arab Open University-Oman Branch. He is also a researcher in English literature and published an article entitled “The Impure Identity in Neruda`s Poetry: Plural Identities” in the International Journal of Literary Humanities. He recently published another article titled "Narrating Irish Identity: Retrieving Irishness in the Works of William Butler Yeats and Seamus Heaney." His research interests include, among others, post-colonialism and postmodernism and their deal with identity, culture and history. Simon Perchik is an attorney whose poems have appeared in Partisan Review, Forge, Poetry, Osiris, The New Yorker and elsewhere. His most recent collection is The Osiris Poems published by box of chalk, 2017. For more information, including free e-books and his essay titled “Magic, Illusion and Other Realities,” please visit his website at www.simonperchik.com. Three Poems by Lynn White: "Autumn Rain," "Nuts." and "Flash"
Sreyash Sarkar , is a poet, painter, practicing Hindustani Classical musician, and an aspiring researcher in Microelectronics and Nanotechnology. Educated in Kolkata, Bangalore and Paris, he has been a student correspondent at The Statesman, Kolkata from his school, South Point. In 2012, in an international poetry competition organized in memory of Yeats, his poem was shortlisted among 40 other poets from all over the world. He has been featured in “Five Poetry Magazine,” “Muses,” “El Portal,” “Tagore for Us,” “The Country Cake-Stall,” “The Orange Orchard,” among others. He is also editor-in-chief of Kalomer Kalomishak, a bilingual magazine, which he founded in 2013. He currently divides his time between Kolkata and Paris. 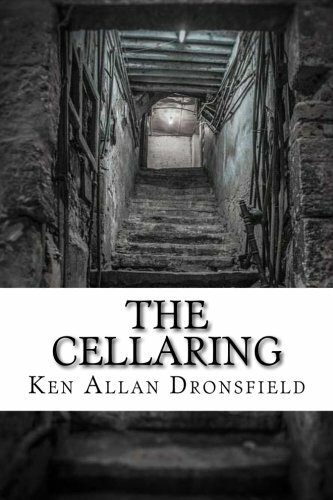 Ken Allan Dronsfield was nominated for The Best of the Net and two Pushcart Awards for Poetry in 2016. His poetry has been published world-wide in various publications throughout North and South America, Europe, Asia, Australia and Africa. His work has appeared in The Burningword Journal, Belle Reve Journal, Setu Magazine, The Literary Hatchet Magazine, The Stray Branch, Now/Then Manchester Magazine, and many more. He loves thunderstorms, walking in the woods at night, and spending time with his cat Willa. 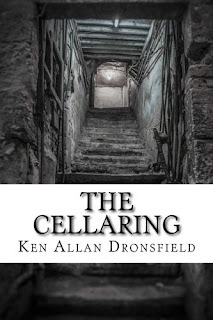 Ken's new book, "The Cellaring", a collection of haunting, paranormal, weird and wonderful poems, has been released and is available through Amazon.com. He is the co-editor of two poetry anthologies, Moonlight Dreamers of Yellow Haze and Dandelion in a Vase of Roses, both available from Amazon.com. Teresa Roberts is a writer and a wanderer. She's the author of "Finding the Gypsy in Me," "Tales of an International House Sitter and Creative Paths to Freedom," "How to Live Your Dream Life ASAP." Her latest book, "Have We Been Screwed? / Trading Freedom for Fairy Tales" is available on Amazon. Teresa has lived all over the world and now resides during the winter in Spain. She notes: "I was bitten by wanderlust many years ago. I was also born with an independent spirit. That might explain my gypsy soul." Three Poems by Ken Williams under the title REASONS WHY: "Survivors," "What Not," and "This One Thing Right"
Ken Williams worked as a social worker for the homeless, primary the mentally ill, but including veterans, women, the elderly, drug and alcohol addicted and the physically disabled in Santa Barbara CA, for over thirty years. His dedication to his clients has been acknowledged by the Board of Supervisors, the State Senate, State Assembly, A.C.L.U. Santa Barbara Chapter, Housing Authority, California chapter of the National Association of Social Workers, and other organizations. His work was highlighted in the documentary, "Shelter," and his writings have appeared in Columbia University’s: Columbia Journal, Cecile’s Magazine, the Huffington Post, The Potomac, Mobius, Better Than Starbucks, The Criterion, and other journals. He is a disabled combat Marine veteran of the Vietnam War. "Fractured Angel," is his most recent novel. His blog is at: Kenwilliams-writer.com. Three Poems by Ann Christine Tabaka: "Ode to the Moon," "The Shadow Game," and "The Sea Below"
Ann Christine Tabaka was born and lives in Delaware. She is a published poet, artist, chemist, and personal trainer. She loves gardening, cooking, and the ocean. Chris lives with her husband and two cats. Her poems have been published in numerous national and international poetry journals, reviews, and anthologies. Jordan Krais is a tall windblown poet from the suburbs of Long Island. He comes from a long line of liars, poets, and story tellers. Goutam Karmakar is a PhD Research Scholar at the Department of Humanities and Social Sciences at National Institute of Technology Durgapur, India. He is a bilingual writer and his articles and research papers have been published in many International Journals. He has contributed papers in many edited books on Indian English Literature. He loves to read and write poetry and his his first book of poetry is planned for later this year. He is interested in Indian English Literature, especially poetry, and Postmodern and Postcolonial literature. G. Louis Heath, Ph.D., Berkeley, is Emeritus Professor at Ashford University. Clinton, Iowa. He enjoys reading his poems at open mic events and often hikes along the Mississippi River, stopping to work on a poem pulled from his back pocket, His books include :Leaves Of Maple," "Long Dark River Casino," and "Redbird Prof: Poems Of A Normal U, 1969-1981." He has published poems in a wide array of journals, including Eunoia, Episteme, Black Poppy Review, Lunaris Review, Whispers, Dead Snakes, Raw Dog Press, Weird Reader, Literary Yard,and Houseboat Literary Magazine. Todd Outcalt lives in Brownsburg and is the author of over thirty-five books in six languages. His recent titles include "All About Martin Luther King, Jr.," and "The Seven Deadly Virtues." These poems will be included in an upcoming book entitled "Circus." Gretchen Ford is a Los Angeles based artist. She paints public space murals as well as smaller works. Website: www.gretchensportraits.com, Instagram: harlequinjester99, 2protectandserve, dtlafaces.